"You've dealt with the rest, now hire the best"
There’s no job too big for Corpus Christi Coastal Cleaning. We offer a wide array of janitorial cleaning services in and around the Corpus Christi area. We clean everything. If you have a facility, we can clean it and keep it clean. Let us keep your facility looking clean and inviting while you worry about running your business. We have the equipment and experience to keep any area of your facility looking great. If you don’t see the type of janitorial cleaning service you’re looking for on our site, just ask us! We have years of experience in keeping facilities clean and chances are that we have done the kind of work that you are looking for. We have professional crews and managers with many years of experience and we know how to do our work professionally and efficiently. More importantly – we know that providing the service you need goes well beyond knowing the chemistry of cleaning and how to use a mop properly. Overseeing janitorial cleaning services for your office is not something you want to think about every day. You just want your work environment to be clean so you can go about your business. And we agree! We provide janitorial cleaning services to a variety of businesses and organizations in and around Corpus Christi including large or small commercial, businesses, educational/ daycare facilities, gym / fitness centers, industrial / manufacturing, car dealerships, and retail. 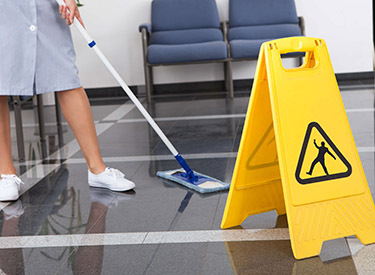 As your janitorial cleaning service, it is up to us to make 100% sure that you are satisfied. That’s why we visit you on a regular basis. We won’t take much of your time, in fact, we’ll only be a few minutes unless you want us to hang around. These visits are important to us because without your feedback we don’t know if you are delighted or frustrated. Also, we can’t respond to your needs unless we carefully listen to you and translate your input into even better service. In addition to on-going janitorial cleaning services with a regular schedule, we also provide one-time cleanings for special occasions, such as the annual board meeting or a company-wide event where every surface needs to sparkle. We can also support you during stressful move-ins and move-outs or we can help you recover from a disaster like a fire or flood. Contact us to discuss your unique facility challenges anywhere in the Corpus Christi area.